Ani Kasten’s delicate ceramic vessels were a sheer delight to see at Philadelphia’s The Clay Studio last week, as her solo exhibition, Offering, opened on Friday evening to a bustling area of “First Friday” art gallery visitors. As I walked around the airy and open front rooms of the exhibit space, I couldn’t help but feel a desire to know more about these pieces, and about the artist herself. 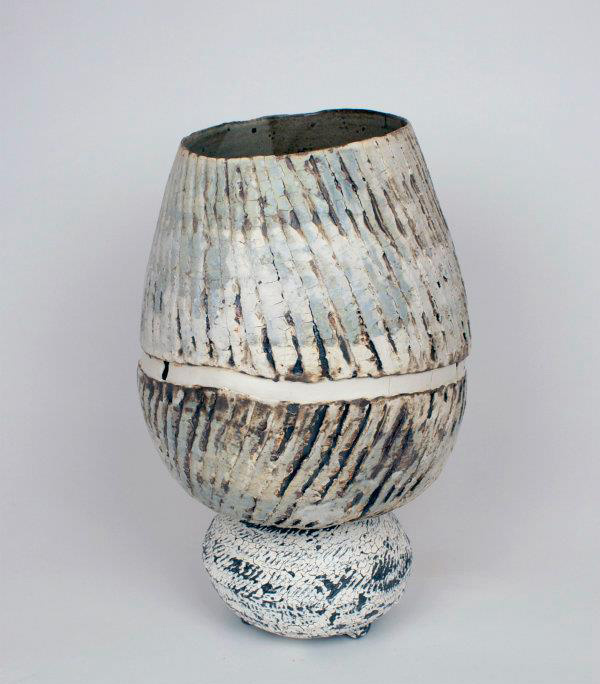 The refined yet subtle palette that Kasten utilizes of black/white/neutral tones in her slips and glazes works to further communicate the delicacy, or rather what I’d refer to as “a substantial vs. a frailty of form” in her vessels, using porcelain and stoneware as her artistic mediums. Blue Green Offering Vessel (Porcelain and Stoneware, 10″ x 10″ x 17″, 2012) is a good example of this dichotomy. However, as an oxymoron, her pieces are not combative one bit, as the “substantial” well-constructed part of her chosen forms seems to offshoot and rather compliment the “frailty” of textures, muted coloring and deliberately off-centered mouths of the vessels. 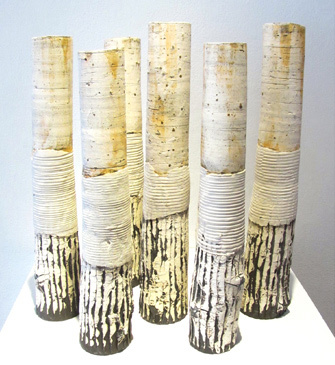 Black and White Forest (Porcelain and Stoneware, 4″ x 4″ x 20″, 2012) is a collection of ceramic sculptural vessels whose breathtaking beauty and minimalist organic form had almost an electrifying presence in the gallery that evening. I found myself staring and walking around the perimeter of the pieces, just trying to absorb what exactly it is about these that enthralled me so much. The scale of these cylindrical works are so intimate at only 20 inches tall. The winding pattern across the mid section of each piece evokes a tree bark texture, along with the blackish strokes rubbed into the base of each piece. Is this sculptural group supposed to be somewhat of an allegorical forest – or more of a collection of memories that Kasten has of an event that seems to have “risen” from a past history, or far-away time? The sepia colors fired onto the clay near the top of the pieces harken a likeness to tree-sap running downwards on a tree – as if to bring back some element of real nature using a warm tone in pieces that are otherwise represented completely in black and white. Offering can be viewed through May 27th, 2012 at The Clay Studio located at 137-139 North 2nd Street in downtown Olde City, Philadelphia, PA. I completely agree! Ani’s work is very inspiring. Thank you for the comment. I agree – Ani is a wonderful clay artist. Thanks for stopping by my blog and commenting. very interesting surfaces…white slip and oxides? I do love the surfaces of these particular pieces – and particularly Ani’s way of allowing her surfaces to almost resemble oxidized metals (in lieu of slips/glazes). Thanks so much Anna for your comments!